WASHINGTON (AP) – It sounds like science fiction, but a cap-like device that makes electric fields to fight cancer improved survival for the first time in more than a decade for people with deadly brain tumors, final results of a large study suggest. Many doctors are skeptical of the therapy, called tumor treating fields, and it’s not a cure. It’s also ultra-expensive – $21,000 a month. But in the study, more than twice as many patients were alive five years after getting it, plus the usual chemotherapy, than those given just the chemo – 13 percent versus 5 percent. “It’s out of the box” in terms of how cancer is usually treated, and many doctors don’t understand it or think it can help, said Dr. Roger Stupp, a brain tumor expert at Northwestern University in Chicago. He led the company-sponsored study while previously at University Hospital Zurich in Switzerland, and gave results Sunday at an American Association for Cancer Research meeting in Washington. “You cannot argue with them – they’re great results,” and unlikely to be due to a placebo effect, said one independent expert, Dr. Antonio Chiocca, neurosurgery chief at Brigham and Women’s Hospital in Boston. Dr. George Demetri of the Dana-Farber Cancer Institute in Boston and a board member of the association hosting the conference, agreed but called the benefit modest, because most patients still die within five years. “It is such a horrible disease” that any progress is important, he added. The device, called Optune, is made by Novocure, based in Jersey, an island near England. It’s sold in the U.S., Germany, Switzerland and Japan for adults with an aggressive cancer called glioblastoma multiforme, and is used with chemo after surgery and radiation to try to keep these tumors from recurring, as most do. Patients cover their shaved scalp with strips of electrodes connected by wires to a small generator kept in a bag. They can wear a hat, go about their usual lives, and are supposed to use the device at least 18 hours a day. It’s not an electric current or radiation, and they feel only mild heat. It supposedly works by creating low intensity, alternating electric fields that disrupt cell division – confusing the way chromosomes line up – which makes the cells die. Because cancer cells divide often, and normal cells in the adult brain do not, this in theory mostly harms the disease and not the patient. In a 2011 study, the device didn’t improve survival but caused fewer symptoms than chemo did for people whose tumors had worsened or recurred after standard treatments. The U.S. Food and Drug Administration approved it for that situation. A second study, in newly diagnosed patients, was stopped in 2014 after about half of the 695 participants had been tracked for at least 18 months, because those using the device were living several months longer on average than the rest. The FDA expanded approval but some doctors were leery because the device wasn’t compared with a sham treatment – everyone knew who was getting what. Study leaders say a sham was impractical, because patients feel heat when they get the real thing, and many would refuse to shave their heads every few days and use an inconvenient device for years if the treatment might be fake. Some doctors said they would withhold judgment until there were long-term results on the whole group. Now they’re in: Median survival was 21 months for those given Optune plus chemo versus 16 months for those on chemo alone. Survival rates were 43 percent versus 31 percent at two years; 26 percent versus 16 percent at three years, and 13 percent versus 5 percent at five years. Side effects were minimal but included blood-count problems, weakness, fatigue and skin irritation from the electrodes. “The device is now impossible to ignore … it absolutely is an advance,” said Dr. Andrew Lassman, brain tumor chief at the Columbia University Medical Center/New York-Presbyterian Hospital. He consults for Novocure, as do some doctors running the study. 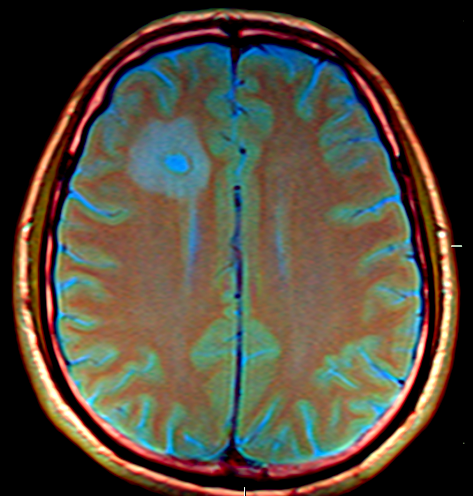 The latest National Comprehensive Cancer Center guidelines include Optune as an appropriate treatment for brain tumors. It’s also is being tested for pancreatic, ovarian and lung cancers; electrodes are worn on the belly or chest for those. The price reflects “an extremely sophisticated medical device, made in very low quantities,” with disposable parts changed several times a week and a support person for each patient, he said. Plus 17 years of lab, animal and human testing. That cost? “The round number is half a billion dollars,” Doyle said. Joyce Endresen’s insurance covers all but about $1,000 a year for her device. “It’s a great plan, and that’s why I still work,” said Endresen, 52, employed by a direct mail company in suburban Chicago. Doctors say many patients won’t try the device because of the trouble involved or because they don’t want a visible reminder of their cancer. Not Endresen.